Concrete ships are ships built of steel and ferrocement (reinforced concrete) instead of more traditional materials, such as steel or wood. The advantage of ferrocement construction is that materials are cheap and readily available, while the disadvantages are that construction labor costs are high, as are operating costs (ferrocement ships require thick hulls, which means extra mass to push and less space for cargo). During the late 19th century, there were concrete river barges in Europe, and during both World War I and World War II, steel shortages led the US military to order the construction of small fleets of ocean-going concrete ships, the largest of which was the SS Selma. Few concrete ships were completed in time to see wartime service during World War I, but during 1944 and 1945, concrete ships and barges were used to support U.S. and British invasions in Europe and the Pacific. Since the late 1930s, there have also been ferrocement pleasure boats. The oldest known ferrocement watercraft was a dinghy built by Joseph-Louis Lambot in Southern France in 1848. Lambot’s boat was featured in the Exposition Universelle held in Paris in 1855. Beginning in the 1860s, ferrocement barges were built in Europe for use on canals, and around 1896, an Italian engineer, Carlo Gabellini, began building small ships out of ferrocement. The most famous of his ships was the Liguria. Between 1908 and 1914, larger ferrocement barges began to be made in Germany, United Kingdom, the Netherlands, Norway, and California. The remains of a British ship of this type, the auxiliary coaster Violette (built 1919), can be seen at Hoo, Kent, England. 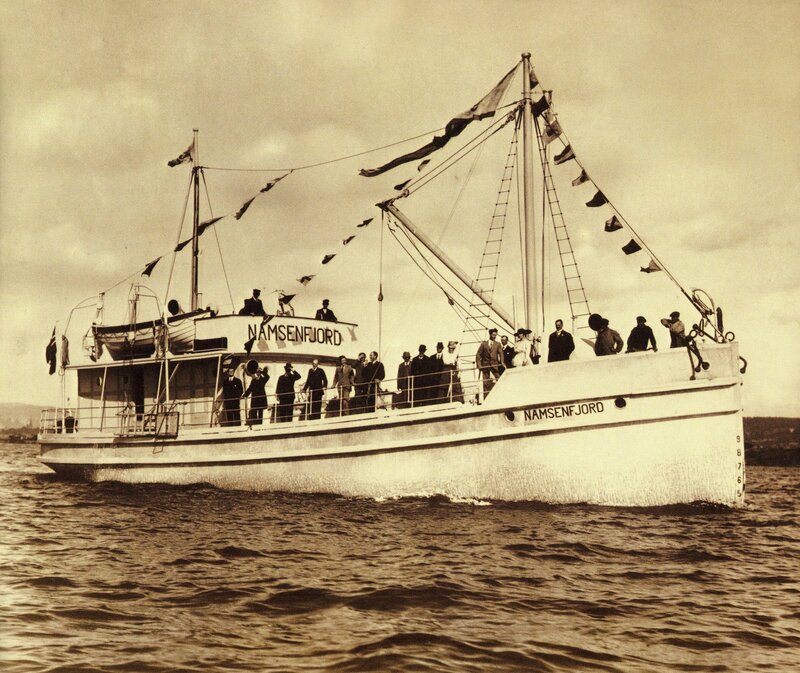 On August 2, 1917, Nicolay Fougner of Norway launched the first self-propelled ferrocement ship intended for ocean travel. This was an 84-foot vessel of 400 tons named Namsenfjord. With the success of this ship, additional ferrocement vessels were ordered, and in October 1917, the U.S. government invited Fougner to head a study into the feasibility of building ferrocement ships in the United States. The Fougner Concrete Shipbuilding Company, Flushing Bay, New York, reported calculated cost was of $290 per deadweight ton for the Cape Fear and the Sapona which they presumably built. About the same time, the California businessman W. Leslie Comyn took the initiative to build ferrocement ships on his own. He formed the San Francisco Ship Building Company (in Oakland, California), and hired Alan Macdonald and Victor Poss to design the first American ferrocement ship, a 6,125-ton steamer named the SS Faith. Faith was launched March 18, 1918. She cost $750,000 to build. She was used to carry bulk cargo for trade until 1921, when she was sold and scrapped as a breakwater in Cuba. On April 12, 1918, President Woodrow Wilson approved the Emergency Fleet Corporation program which oversaw the construction of 24 ferrocement ships for the war. However, when the war ended in November 1918, only 12 ferrocement ships were under construction and none of them had been completed. These 12 ships were eventually completed, but soon sold to private companies who used them for light-trading, storage, and scrap. Other countries that looked into ferrocement ship construction during this period included Canada, Denmark, Italy, Spain, Sweden and the United Kingdom. 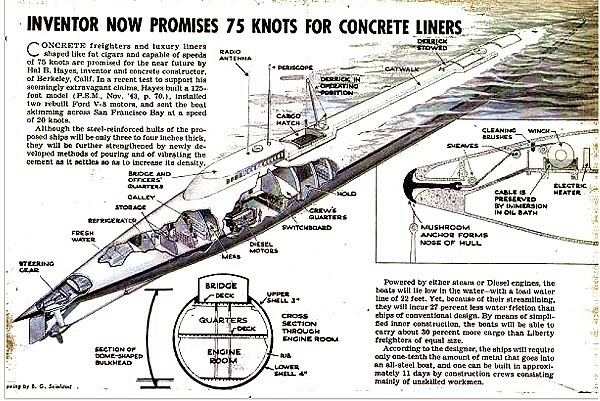 Between the world wars, there was little commercial or military interest in concrete ship construction. The reason was that other shipbuilding methods were cheaper and less labor intensive, and other kinds of ships were cheaper to operate. However, in 1942, after the U.S. entered World War II, the U.S. military found that its contractors had steel shortages. 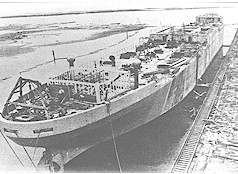 Consequently, the U.S. government contracted McCloskey & Company of Philadelphia, Pennsylvania to build 24 self-propelled concrete ships. Construction started in July 1943. The shipyard was at Hookers Point in Tampa, Florida, and at its peak, it employed 6,000 workers. The U.S. government also contracted with two companies in California for the construction of concrete barge ships. Barge ships were large vessels that lacked engines to propel them. Instead, they were towed by tugs. In Europe, ferro cement barges (FCBs) played a crucial role in World War II operations, particularly in the D-Day Normandy landings, where they were used as part of the Mulberry harbour defenses, for fuel and munitions transportation, and as floating pontoons. Some were fitted with engines and used as mobile canteens and troop carriers. Some of these vessels survive as abandoned wrecks in the Thames Estuary; two remain in civil use as moorings at Westminster. 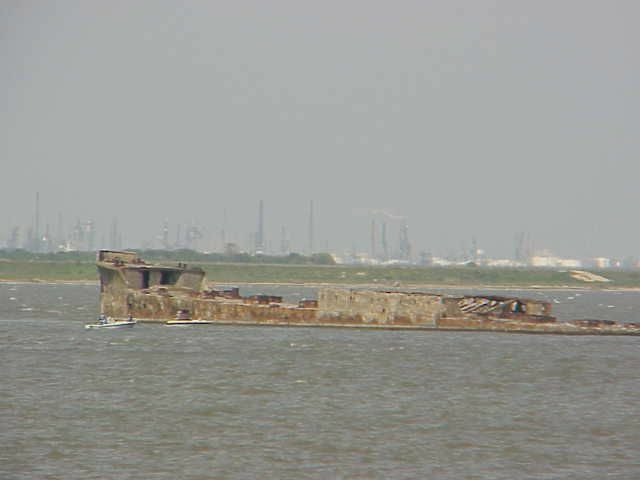 One notable wartime FCB, previously beached at Canvey Island, was destroyed by vandals on May 22, 2003. In 1944 a concrete firm in California proposed a submarine shaped freighter which they claimed could achieve speeds of 75 knots. The war ended any more research into the project. In retrospect many believe the claims were greatly overstated. One concrete barge under tow by Jicarilla (ATF-104) was lost off Saipan during a typhoon, and another knocked out a light house in Brisbane but the rest served admirably. Surviving concrete ships are no longer in use as ships. Several live on in various forms, mostly as museums or breakwaters. For example, SS San Pasqual, a former oil tanker, lies off the coast of Cayo Las Brujas, Cuba, where it served as a hotel, then as a base for divers. Currently, the San Pasqual is abandoned. The wreckage of SS Atlantus (commissioned in 1919, sunk in 1926), is visible off Cape May, New Jersey. The aforementioned tanker SS Selma is located northwest of the fishing pier at Seawolf Park in Galveston. The ship was launched the same day Germany signed the Treaty of Versailles, ending the war, so it never saw wartime duty and instead was used as an oil tanker in the Gulf of Mexico. One of the few ships used in World War I, the SS Creteboom, lies abandoned in the River Moy, just outside the town of Ballina, County Mayo, Ireland and is considered of much interest to the area’s many tourists. The largest collection, though, is doubtless at Powell River, British Columbia, where a lumber mill uses ten ferrocement ships as a breakwater. The SS Palo Alto, a concrete tanker that was launched May 29, 1919, was purchased and turned into an amusement pier, and is still visible at Seacliff State Beach, near Aptos, California. The SS McKittrick, launched in 1921 in Wilmington, N.C. later became the SS Monte Carlo, a gaming ship off Coronado, California that ran aground on December 31, 1936. The wreck is periodically exposed by strong storm tides. The vessel aground in the surf at Shipwreck Beach on the north shore of Lanai, Hawaii is ex-YOGN 42, a concrete gasoline barge built for the US Navy in 1942 and placed in service in 1943. The wreck is often misidentified as a Liberty ship. The remains of the Col. J. E. Sawyer can be seen near the USS Yorktown in Charleston Harbor, SC. The collection of vessels intentionally beached at Purton during the first half of the twentieth century – as a method to prevent coastal erosion – includes eight ferro-concrete barges. In Europe, especially the Netherlands, concrete is still used to build some of the barges on which houseboats are built. Very few modern hobbyists build ferrocement boats (ferroboats). The reason is that construction methods can require special tools, construction is labor intensive, materials no longer are comparatively cheap, and they are expensive to operate, especially when compared to the varied types and sizes of boats that can be built from wood, plywood, fiberglass, aluminum and steel. One Response to Boats Made of Concrete? Interesting! This construction method was popular in the 1960s and 70s, particularly with firefighters who built their boats in the station yards in between call outs, it should properly be called FERROCEMENT and never concrete as contains only the finer range of aggregates. It is as stated a labour intensive construction method and requires highly skilled plastering teams to make a fair finish. However, the reason for its drop in popularity over the past 30 years is less to do with the cost of the hull, which is relatively small percentage of the total build cost, but more to do with difficulty and cost and availability of comprehensive insurance for Ferrocement boats and residual resale value compared with other methods of construction, based upon dubious total loss claim for badly built hulls. Well built boats, such as the Peter Ibold Endurance range built by WIndboats in Wroxham England, are still in active service 40+ years after launch, are extremely fair, incredibly strong and durable, require less maintenance than other forms of construction, and often of considerably less weight than many traditionally built wooden or steel craft of similar design and dimensions. If there is a fault with Ferrocement it is generally with the builder and design, not the material or method, but then this surely applies just as much to other boat building methods.